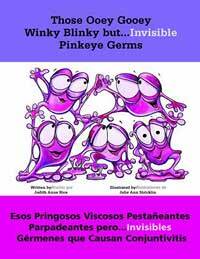 The fourth title in the bestselling Children's Health Series from Redleaf Press, Those Ooey Gooey Winky Blinky but...Invisible Pinkeye Germs is another fun and informative book explaining germs kids can't see. Children will learn how pinkeye germs can be spread and how to treat them. Imaginative language, colorful illustrations, and photos of a real child tell about a girl who gets pinkeye and her notions of the germs. This book includes health information for teachers and caregivers. Bilingual English/Spanish. Lively, colorful illustrations show the germs that cause cavities and how important toothbrushing is to good dental health. 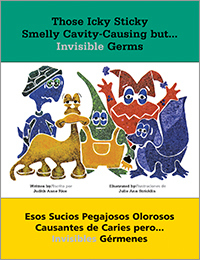 The bad breath germ and the plaque-painting germ help children remember to brush their teeth.This book includes health information for teachers and caregivers. Bilingual English/Spanish.